NOTE - Larry is on the USATT Board of Directors and chairs the USATT Coaching Committee, but the views he shares in his blog are his own, and do not necessarily represent the views of USA Table Tennis. Make sure to order your copy of Larry's best-selling book, Table Tennis Tactics for Thinkers! Finally, a tactics book on this most tactical of sports!!! Also out - Table Tennis Tips and More Table Tennis Tips, which cover, in logical progression, his Tips of the Week from 2011-2013 and 2014-2016, with 150 Tips in each! Or, for a combination of Tales of our sport and Technique articles, try Table Tennis Tales & Techniques. If you are in the mood for inspirational fiction, The Spirit of Pong is also out - a fantasy story about an American who goes to China to learn the secrets of table tennis, trains with the spirits of past champions, and faces betrayal and great peril as he battles for glory but faces utter defeat. Read the First Two Chapters for free! I was doing some research on something recently and came across an article I wrote in the Sept/Oct 1994 issue of USA Table Tennis Magazine. The article was my diary as the USA head coach at the King Car International Youth City Championships in Taipei, Taiwan, Aug. 22-30, 1994. We had two boys' teams and two girls' teams, with 14 players. Many of the best junior teams from all over the world attended, including teams from all over Europe, Asia, and a few from South America and Africa. The notable missing team was China, since we were in Taiwan. Before the tournament we had a five-day joint training camp with the Taiwan and South Korean Teams. I noticed that their players had incredible footwork and forehand loops, but their backhand loops were rather weak. So I called our team together and told them our focus during the tournament was simple - get your backhand loops into play as they weren't used to facing them. The strategy worked - USA #1 (Dave Fernandez, Barney J. Reed, Richard Lee) came out of nowhere to get third place in Boys' Teams, beating some of the best teams from Taiwan, South Korea, and Sweden - with each match played in front of 20,000 screaming fans!!! What jumped out from reading the article was how the game is changed. Here are three excerpts. "There were few shakehand players with inverted on both sides. There were many penholders, both pips in and inverted, and many shakehand players with combination rackets. Nearly all the top shakehanders, however, seemed to be either long-pipped choppers, or have pips-out on one side. Interestingly, more players had pips on their forehands than on the backhand." In tournament party, all the junior teams were expected to give a 3-minute skit or sing a song. Team USA sang "Take Me Out To The Ball Game" and then "Row Row Row Your Boat." They then dragged me up front to demonstrate my ball-blowing trick, where I balance the ball - to the side - in the air by blowing on it, spinning the ball so it doesn't fall. At the tournament party, Team USA won the "Fetching Contest." The rules were simple - the winner was the first team that could gather 10 watches, 5 necklaces, and 5 belts won. We were the Champions. I wrote a long paragraph about the Taipei traffic, where huge numbers of motorcycles and a smaller number of cars weaved in and out like crazy, just missing each other by inches, and nearly every car had dents on them. We lived in daily fear of our daily commute to the playing hall! Here are the videos (1:19 and 3:11) featuring Samson and Kenzie. Here's the USATT article featuring a retrospective analysis of the 2016 Men's World Cup by Robert Ho. Here are new videos, both from the 2018 Final Champions League. Former long-time USATT webmaster and long-time player from the Virginia Roy Seguine has died. Here is the Tribute Wall. I'll post when an obit goes up. Here's the article. "Ping pong club and restaurant Spin is finally opening its sprawling downtown Austin location this week on Friday, May 18 at 9 p.m."
Here's the article on the event at the Broward County TTC in Florida, by Gary Curreri. Here's the video (1:50) by Leon the Magician. So . . . how do you think he did it? World Veterans - over 4000 entries. However, there have been problems with visas from some countries, likely due to the U.S.'s changing to more restrictive policies, and we may have lost up to 100 entries. We also arranged to have a USATT board meeting at the Veterans on Wednesday, July 20, with a board dinner the night before. U.S. Nationals. Final entry deadline is May 25, so what are you waiting for? Then we went into closed session to discuss legal matters. I wish I could discuss these matters, but I cannot. I'm hoping the saga of the biggest issue discussed will come to an end sometime this summer so I can write about it. I've hinted about it a few times, but suffice to say it's mind-boggling how one person can waste so much of everyone's time. I've now spent nearly 100 hours on this one issue that only about 20 people in USATT know about. Meanwhile, I finished the USATT Hall of Fame Banquet program book last night (6 pages), other than getting the finalized list of the 2018 Hall of Fame Boosters and final proofing. If you'd like to donate and join the USATT Hall of Fame Boosters Club, here's the Donate Page. Here's the 2017 Hall of Fame Boosters Club. Here's the video (33 sec) - this should be a part of any training program. Here's the video (15 sec) as he does speed multiball. Can you do this? Here's the video (43 sec) - why haven't you developed this? Here are three new videos. Fastest Reflexes in Table Tennis (53 sec) - wait'll you see this rally between two Hong Kong Kids! Fang Bo Exclusive Interview (7:24) - alas, it's in Chinese, but it's interspersed with lots of video of him playing. Incredible 80 years old table tennis player (1:18) - and he's playing with a big wooden 2x4! Looking for an Over 50 Doubles Partner for the World Veterans? Mike Levene is looking for a partner. He's a lefty looper, rated 2110, previously as high as 2229. He and I made the final of Over 40 Doubles at the 2010 U.S. Open, losing the final to Dan Seemiller/Mark Nordby. He runs the Smash TTC in Virginia. Contact him directly at 678-682-1907 or email him. Here's the ITTF article that features Liu Shiwen. In the new ITTF rankings (that give more weight to participation) she's only #10 in the world, but she's obviously better than that. She was #1 for 11 months, 2015-2016, and spent six months of 2017 as #2. When ITTF came out with their new rankings, in one shot she dropped from #4 to #24. Here's the article. "From 50 cm Long Handles to Boosters (and Everything in Between)." Here's the video (59 sec) of USA's 1937 and 1938 World Women's Singles Champion doing an exhibition with Sandor Glancz. Here's the video (4:18) - not for the squeamish! But seriously - wouldn't any table tennis player with a good forehand be great at this? I did a lot of doubles coaching on Saturday during the Junior League Training. This is a joint junior league and training session (mostly ages 8-13), where we do both singles and doubles, often using improvised games so the players get specialized type training. For example, we play games where the server loses the point if he doesn't serve and attack, or gets two points if he serve and attacks and eventually wins the point, or where the server starts out behind 7-9 or 8-10. And so on. The Wanderers. These two are good in singles, but in doubles they had this "wandering" habit. After hitting their shot both tended to move way, Way, WAY out of the way, bordering going into the next court. They'd go off to the side and back, and then, after their partner hit their shot, they'd be in the wrong country for their own shot, leading to many on-the-run lunges. Ideally, players should move mostly back and slightly angled away from their partner, but stay as close to the table as they can so they can get to the next shot. The Blasters. I think this is self-explanatory - they both went for every shot. I kept reminding them that they should put some topspin on their flips, and try not to break lightspeed with each shot. The Pushers. Again, self-explanatory. How many times did I have to remind them to stop pushing against topspin serves??? (Yeah, lots of pop-ups.) And please, Please, PLEASE will one of you attack the ball??? The Loop and Lob Brothers. One would loop, the other would, well, just get the next ball back, even if it was a weak return. That's the problem when you put a conventional attacker with a more defensive-minded player. Surprisingly, such teams often can become pretty good with practice, but they need to really focus on tactically playing together, and taking advantage of their respective strengths and weaknesses. For example, the defensive-minded one knows that he's going to get more weak balls than he usually does, since his partner is often looping, so he should be set to take the smash when it's there, rather than stand in his often defensive position. Similarly, the attacker doesn't need to force his attacks since his partner is comfortable if he pushes. The Long Servers. When playing against loopers - which is most players - serving long over and Over and OVER isn't the best tactic. But even though the players can serve short, they don't really think about this unless I remind them once or twice or a trillion times. The Arguers. There's something surreal about games where I find myself saying, multiple times, "Is there any way I can get you two to stop bickering and to play?" Here's the article, with links to video, from EmRatThich. "How do Chinese table tennis players practice? What is the training method in China? Why don’t Chinese players miss the easy ball? And why they are so good compared to other countries? Today, let’s talk about the training method in China and the main difference between the training drills in China and in the Western countries." Here's the video (1:18) from the Golf Channel! "Go steel some ping-pong paddles from the kids" - apparently he hasn't seen Olympic table tennis! Here's the video (16:14). Franziska of Germany is world #27; Jancarik of Czech Republic is world #111. I'll be running them at MDTTC, June 2-3. You have to be a Maryland resident to play in championship events (Men's and Women's Singles, Open Doubles, age events), but the rating events are open to all. Here's the article from ESPN. Here's the article on the tournament held in Fayetteville, NC. Here it is - I have no idea what it is, but it looks pretty wild! Here's the video (4:01)! Wait till you see the guy rallying on two tables, and using an air dryer as a "racket"! WORLD VETERANS AND USA NATIONALS. My shoulder is rapidly improving, and I actually think I probably could do private coaching now. I can tough my back with my right arm again (yay! ), and no longer have to hold it with my left when I comb my hair. (Seriously, how funny does it look combing your hair while using your other arm to hold the combing arm?) But here's the problem - if I did so and re-injured it, I'd be right back where I was before. So I'm planning to wait until at least late summer or even September before I start up private coaching again. When I do so, I plan on greatly limiting my hours, probably doing private coaching only two times a week. This is both to minimize the chance of re-injuring the shoulder and other injuries, plus it opens up more writing time. For now, I'll continue just running group sessions. I have both my table tennis and science fiction writing careers. After much reflection, I've decided these are my next books, in this order. Campaign 2110 and Campaign 2120, sequels to my 2016 science fiction novel Campaign 2100: Game of Scorpions, a drama/satire that covers the election for president of earth in the year 2100, where the world as adopted the American two-party electoral system. This was always planned as a trilogy, and it's been bugging me for a while that I hadn't gotten to the next two novels. As I've blogged in the past, the novel contains a considerable amount of table tennis! One of the four main characters is a professional table tennis player (who leaves the pro table tennis circuit to run a worldwide presidential election), and during the campaign teaches another of the four main characters, an alien ambassador, how to play - and since her ancestors snatched flying insects out of the air, she has far better coordination and reflexes than humans, and soon begins to beat him. I'll have them continue the table tennis as the adventures move to other worlds. The complete titles of second and third volumes are Campaign 2110: Scorpions in Space, and Campaign 2120: Galactic Scorpions. Parents' Guide to Table Tennis. I've been planning to write this for a long time and keep putting it off. I may work on it during the break between the World Veterans and Nationals, unless I'm working on the two Campaign novels above. Table Tennis Fundamentals. This would be an updated and expanded version of Table Tennis: Steps to Success, my previous book on the fundamentals of table tennis. My goal is to get the photos done this year - I'm having difficulty deciding who I should hire for this! Then I hope to write this next year. Or maybe I should just demonstrate the shots myself? My strokes are rather stiff and aren't good for video, but if I'm only doing photo sequences . . . maybe. There's been a big change in my life recently as I find I get more writing done with Dr. Pepper than Mountain Dew. What a life-changer that is!!! :) (Pizza + soft drink = productivity.) These days I only drink soft drinks when I'm writing or at movies, so don't worry, I'm not overdoing it. After hitting 200 pounds in December, current weight is 179, and I'll be under 175 soon. I taught the class last night, with John Hsu assisting. We started with 15 minutes of multiball footwork. Then we moved to the day's focus - pushing. We gave the usual demo (with a multi-color ball so they can see the backspin) and a short lecture, and then had them practice. All were able to create a decent backspin, even the youngest in the class, about age 7. Then we went to games, including the popular "worm juice" game for the younger kids, who are all getting too good at smacking the Gatorade bottle (as I feed multiball), forcing me to drink the dreaded "worm juice."! The early "Early Bird" deadline is TODAY, May 11, so don't forget to enter TODAY!!! Tomorrow the cost for adults goes from $250 to $325, for juniors from $225 to $300. Here's the USA Nationals page, July 2-7 in Las Vegas. Here are two new training videos from 3T Table Tennis Training. Table Tennis Serves and Serve Training (6:04). Aspects of Table Tennis Drills (5:16). Here's the article by Samson Dubina. "One year at the US National Team Trials, I was leading 3-2 against Mark Hazinski and leading 9-3 in the 6th game. After a series of aggressive mistakes by me, he closed the gap 9-8. I simply pushed and blocked the next 2 points to win the match 11-8 in the 6th. Walking off the court, my coach said, 'I would rather have you lose the match than to win it like that.' I replied, 'The goal was to win.'" Here's the article by Eli Baraty. "Knowing the outcome is a big problem for our sport or any sport for that matter! For example, if I took a Ferrari and a Ford Focus on a track and announced to all my family and friends come and watch these two cars race, I’m pretty sure no one would be interested." Here's the video (8:13) from EmRatThich. "Xu Xin is not only the Show man. He also has the "Golden Hand" in table tennis. This is the best rallies of Xu Xin in the WTTTC 2018 World Team table tennis Championship in Halmstad." Here are two recent matches of the 14-year-old Japanese whiz kid, now ranked #10 in the world. Harimoto vs. Vladimir Samsonov (1:22 - key points) - at the Worlds, down 0-2, Harimoto comes back to win 11-8 in the fifth. Here's the video (50 sec, including slo-mo replay). Denis Kozul (world #109 from Slovenia) is serving from down match point to Jon Persson (world #68 from Sweden), but drops his racket on the table right after the serve. Persson puts the ball in the net, so it's seemingly Kozul's point, right? But the umpire awards the point, and the match, to Persson. The reason is not given in the video. However, I suspect it's because Kozul apparently touched the table with his free hand while picking up his racket. But then, at the end of the video, the umpire seems to change his mind, and calls the score 7-10, now awarding the point to Persson, and the score boards now reflect that. So I'm not sure what happened here. An umpire can't change a judgement call, and if he judged Kozul touched the table, or did something else to lose the point, I'm not sure how he can legally change it from declaring Persson the 11-6 winner to 10-7. Here's the ITTF article. "Enthralled by the stars of the sport but there was another reason why the man, who enjoyed number one hits in Europe in the 1980s, was present in the Swedish west coast resort." "…he presented the Ping Pong Parkinson project, an initiative of which he is the founder having recently organised a tournament at the Westchester Club in New York for those who suffer from the illness." Here's the picture. (Here's the non-Facebook version.) Now that's a nice looking trophy! Here's the video (10 sec)! I blogged about the USA Nationals on April 19, where I wrote about the 91 events, spectating, equipment booths, the Hall of Fame Banquet, the VIP package, the USATT board meeting, and the coaching seminar I'll be running. I blogged about the new world rankings on Tuesday (4th segment). Here are four new articles and a video on them. First places retained, more senior colleagues change top positions (ITTF) "Kanak Jha of the United States and China’s Qian Tianyi retain their positions at the top of the respective Under 18 Boys’ and Under 18 Girls’ World Rankings." Here's the article by Coach Jon. "Experienced players are often excellent diagnosticians. You may not need to have played very long to recognize weaknesses in other players. Watching other players gives some insights, but playing a match against them reveals far more about their abilities. Every player comes with their own idiosyncrasies. Some of these traits provide special strengths for them, but some may stall their progress for years." Here's the USATT article by Matt Hetherington. Here's the article by Steve Hopkins. Here's the article from Inside the Games. "…but warned they should only do so if it increases their chance of success." Here's the ITTF article. "Age is no barrier, without doubt Luxembourg’s Traian Ciociu, is young at heart, the 55 year old is the most senior player on duty at the current Liebherr 2018 World Team Championships in Halmstad, Sweden. Motivated, he fulfils both the role of player and that of the guiding hand for the younger players in his team." Here's the USATT article (with links to video) by Robert Ho: 2016 China Open, Top Two Tangle Times Two. Here’s chapter 27 of Tim Boggan's latest volume, which covers 1993-1994. Or you can buy it and previous (and future) volumes at www.timboggantabletennis.com. Chapter 27 covers "1994 May-June Tournaments." Note that Volume 21 is now out. This volume is 438 pages with 1667 graphics, and covers all the wild things that happened in 1994-95 - and I'm mentioned a lot! Why not buy a copy - or the entire set at a discount? Tim sells them directly, so when you order them, you get it autographed - order your copy now! ITTF President vs TableTennisDaily's Dan! Today is "Larry's Gripes" Day! Everyone should be allowed to air their gripes once a year. Here are mine. Dealing with constant shoulder problems, though they seem to be getting better. I think I'll start an association, Union of Shoulder Recoverers (USA). Let's make USA #1! Dealing with a certain USATT member who has wasted more USATT time and energy than anyone in the past ten years. I've spent 90 hours on this person's issues (others have spent far more), and am doing all I can to get out of the web of intrigue and accusations (and, unfortunately, nonsensical, time-wasting grievance cases) he makes on a semi-regular basis. Dealing with the daily requests for articles - or more specifically, the ones who don't understand that just because they preface their request by saying, "Larry, you are such a great writer!" doesn't mean I have the time or energy to write an article about anyone or anything that someone asks me to do - and why do I seem to owe this to so many people just because I'm supposed "such a great writer!"? (Okay, I like that last part.) The large majority of my table tennis articles are for my blog, a Tip of the Week, for USATT, Butterfly (my sponsor), my club (MDTTC), and upcoming books or novels. Seriously, when someone asks me to write an article, they are basically saying, "Larry, I want you to write my article because it's more important than the next chapter of your book." Remember, there are a lot of these requests, and only one of me. (USATT, Butterfly, and MDTTC are somewhat exempt from this. Did I mention my shoulder problems? Students who show up late for a class and thereby miss the opening lecture and demo. Those who have all the answers for USATT and assume no one else has thought of what they believe is the answer, or that it has already been tried in some way, nor are they normally willing to do the work needed to apply the idea, assuming USATT has the manpower to do so. (It doesn't.) Suggestions are great, but first do a little checking on the history of the idea - feel free to email me or someone else with a long table tennis history to see if it's been tried, and if so, how it was tried so you can see if there's perhaps a better way of doing it. Again, keep in mind that USATT has limited resources. Lefty's with good backhands. Really, I never want to play them. They're evil. They have that wide angle into my forehand. Seriously, they are all Sith. Phone calls out of the blue from people I don't know. I prefer email so I can deal with it between tasks, rather than interrupting whatever I'm doing - and I'm almost always doing something. I only give my phone number out to a select few, but somehow people find it. I think there's a TV reality show out there somewhere titled, "Find Larry's Phone Number and Call Him When He's Busy." Parents who believe they know table tennis better than the coach. Fortunately, the great majority do not. People who want me to do their research on things that they could easily Google. People who read the previous item and literally thought I remember the 1937 Worlds and must be really, really old, like 100 or so. Here's the article by Samson Dubina. Learn about the Nandan, Lily, Mike, and Roger Effects! Regarding the Lily Effect, I always seem to play my best when I'm down 8-10. So I'm always imagining that is the score, even at 0-0. Here's the article by Tom Lodziak. Here are a series of training videos. Click on the arrow to see the next one. The commentary is in Chinese but you can learn by watching the technique. Here's the video (10:38) from EmRatThich. "Watch 11-year-old table tennis sensation Aljay Villena, the best hope of Philippines for that elusive 1st Olympic gold medal." Here's his letter about the Worlds. Here's the video (3:18) - guess who plays table tennis? Go to 1:48 in the video to find out! Forget Spider-man, it's Spider-day at MDTTC! At least on Saturday it was. During a junior session a giant Wolf spider came crawling into the playing area. You can imagine how the kids reacted. At first the coaches shooed them back to the tables, as the spider was near the barrier, away from the table. But someone had to take action we needed a hero! I grabbed a box, and with my paddle, got the thing to crawl onto it. Then I let it go outside, despite several girls screaming, "Kill it!" Despite all the excitement, we got some serious table tennis in. We did a lot of up-down table games, but had them start with varying scores, such as the server is down 7-9 or 8-10. In my Sunday Beginning Class the focus was on smashing. Which is almost as exciting for them as the spider was on Saturday. Then we had the more advanced Talent program, where we challenged them with more complicated drills than usual. For example, in one drill the player would serve short backspin his partner's forehand. Partner would quick-push to the wide forehand. Player would loop down the line to partner's backhand. Partner clocked it crosscourt to player's backhand. Then then they continued the rally with the backhand-forehand-forehand drill. We also did a bit of serve practice, and I'm impressed with their improvement. Some may remember I noted in a blog earlier this year that I thought some of them needed a lot of serve practice, but that's exactly what's happened. One kid, who absolutely could not put backspin on the ball back in January, may now have the heaviest backspin serve in his group - yeah, he got determined and has been practicing it, and can now make the ball bounce backwards on the far side of the table. Here's a quick update on my shoulder. After the cortisone shot on Wednesday, the shoulder is suddenly feeling good for the first time since last September!!! This is also due to two months of physical therapy (3-times/week for 90 minutes), plus one to two 20-minute stretching routines each day. Amazingly, I can do something I haven't been able to do in years - put my playing arm flat against my back. However, just to be safe, I don't plan on playing for a time. When I do return - tentatively in the fall, but perhaps late summer - I will likely restrict my private coaching to less than before, while continuing with the four group sessions (6.5 hours) I do each week. Here's the ITTF video (2:30). The new world rankings are in, after the World Team Championships. On the Men's side, Fan stays #1; Ovtcharov and Boll trade places as #2 and #3; Ma Long mysteriously stays at #6 despite being the best in the world; and 14-year-old Japanese whiz kid Tomokazu Harimoto moves into the #10 spot (from #13 last month, and #11 in Jan and Feb). On the Women's side, the top three spots stay the same, but Singapore's Feng Tianwei drops from #4 to #9. Ding Ning, who many believe is the best in the world and who was #1 for a year until October, dropped from #11 to #16, while Liu Shiwen, another candidate for best in the world (world #1 or #2 for most of 2016-2017), stays at #10. These Chinese players may dominate at the table, but they apparently don't compete as often as their counterparts, and the new system punishes them for that - while making the rankings less accurate. USA's Kanak Jha moved from #82 to #72, but no other USA men are in the top 300. USA's Lily Zhang moved from #55 to #53, while Yue Wu exploded from #122 to #72. Crystal Wang (who wasn't at the Worlds) moved up one spot to #155, with no other USA women in the top 200. Here is a gallery from Steve Rowe. It's on Facebook, so I'm not sure if non-Facebook users can see it. 8 Slump-Busting Tips: How do I GET OUT of this slump? Here's the article by Samson Dubina. Serve and Attack . . . Almost Always. The World Team Championships finished yesterday in Halmstad, Sweden, April 29 - May 6. SPOILER ALERT! Yes, China won Men's and Women's Teams (again, for the 21st time each), this time over Germany and Japan. So it was more of the same, but also more of the new. (See the numerous links on this below, as well as Team USA info.) Basically, only three men's team can give any serious challenge to the Chinese right now - Germany, Japan, and South Korea - but they are big longshots. It's unfortunate that Germany's Dimitrij Ovtcharov (world #3) was injured and couldn't play in the final, but it's unlikely that would have changed the final result. It's easier for a ping-pong ball to go through the eye of a needle than to beat a team that has Ma Long and Fan Zhendong. On the women's side, Japan (and perhaps Hong Kong) are the only countries that can challenge the Chinese, but it'd still be a sizeable upset if anyone were to beat the Chinese women, a team that includes world #1 Chen Meng, #2 Zhu Yuling, Liu Shi Wen and Ding Ning. Guess what all four have in common? All have been ranked #1 in the world in the last 20 months. (Liu and Ding are currently ranked #10 and #11, but those aren't realistic and says more about the new ITTF system which favors participation more than before. Ding was #1 as recently as October 2017, Liu in September 2016. Many still consider Ding the best in the world. China didn't even play world #1 Chen Meng in the semifinals or final.) But the Japanese women have one thing going for them - a younger team that could get better. China has won Men's Teams the last nine times in a row, and 11 of the last 12. The last non-Chinese winner was Sweden in 2000. Overall, China has won Men's Teams 21 times. Hungary is second with 12, winning in 1979, 1952, 1949, and nine times in the 20s and 30s. Japan is next with seven, all from 1954-1969. Next is Czech Republic, but all their wins came from 1932-1951. Sweden is next with five (1973, 1989, 1991, 1993, 2000). Only three other countries have won Men's Teams - Austria in 1936, USA in 1937, and England in 1953. China has won Women's Teams four times in a row. They first won it in 1965. Their dominance began when they won it a second time in 1975, and since then have won 20 out of 22 times, including 12 of the last 13. (The exceptions were Singapore in 2010 and a Unified Korea in 1991.) Overall, China has won Women's Teams 21 times. Next best is Japan with 8, all from 1952-1971. Next is Romania with 5, all from 1950-1956. Next is Czech Republic with three from 1935-1938. Winning two each are England (147, 1948), Germany (1933, 1939), and USA (1937, 1949). Only four other countries have won Women's Teams - Soviet Union in 1969, South Korea in 1973, Unified Korea in 1991, and Singapore in 2010. ITTF Video Page (you have to register). Insane Shot by Xu Xin at the Worlds (1:28, shot happens in the first 12 seconds, the rest are replays from different angles and slo-mo). Team USA did pretty well - USA Women especially. They went in ranked #23 in the world, but finished #13, which means that at the next World Team Championships in two years they'll be playing in the Championship division! USA Men also did well. They were ranked #44, but finished #33. Here are links involving Team USA. And now we go on to other table tennis news of the day - except there's very little! It's been nothing but Worlds, Worlds, Worlds all weekend. Here's the ITTF article featuring USA's Christian Lillieroos in India. "A hot bed for coaching courses, Ajmer in India’s Rajasthan province was the recent home for yet another initiative organised under the auspices of the ITTF Development Programme." "I Love You So Much I Would Do Anything For You!" 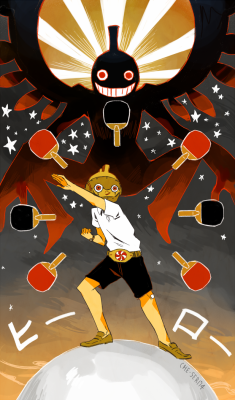 "Quit Table Tennis." Yesterday a top player emailed me pointing out something about the unified Korean team issue that I should have addressed in my blog yesterday. (He asked to stay anonymous.) We're all thinking what a wonderful thing this was, Korea unifying as one team, as they did in 1991 when they last won Women's Teams at the Worlds (over China). But let's take a closer look. The Korean team(s) got to move one round further without playing, when normally half of all teams lose in each round. While other teams were playing - and it's exhausting at that level - they got to rest. Japan suddenly has to face a stronger team than they were supposed to. Was this fair to Japan? Now the ITTF rankings are not as accurate as they were before, since they now take participation into mind, so it's not clear that the #1 North Korean, Kim Song I, ranked #49, is really that level - she might be better. I really don't know. However, it would have been politically tough to take a unified team and play only South Korean players. And so in the final, Kim did play - and she's the one who lost 16-14 in the fifth to Japan's Kasumi Ishikawa, world #3! So she's probably better than her #49 ranking would indicate. Those rascally ITTF rankings! So why didn't they play Suh Hyowon, easily the top ranked Korean player? Imagine if Kim Sing I had pulled off that win, and perhaps one other, and Korea played world #12 Suh Hyowon, and she won a match - then Korea would have defeated Japan and gone into the final. I'm sure Japan would have been fine with that, right? Conspiracy theorists might say there was some deal with the Japanese whereby if they didn't complain about the Koreas united against them, in return the unified Korean team would sit out their #1 player. They also played the North Korean #1, #49 in the world, instead of the South Korean #4, Choi Hyojoo, who is #47 - but of course results did show that Kim Song I was much better than her #49 ranking. But again, why didn't they play world #12 Suh Hyowon? Unless she was injured, was it right and fair (to her as well) to sit her out? Japan also has players ranked #13, 18, 19, 22, 23, 24, 34, 41, 44, 66, , 79, 81, and another eight players between 100 and 200. Next to China, they have the most depth of any women's team in the world. Seriously, Liu Shiwen #10 and Ding Ning #11? China simply has the best players - probably. And yet, Japan's team is younger and perhaps hungrier, and there's no telling - until they play tomorrow - just how good they might be. Suffice to say China will likely have their hands full. Meanwhile, now that we've set the precedent that two teams can in mid-tournament, after playing into the quarterfinals, can combine as one team, can we field a unified China/USA team in the Men's and Women's Finals? Think of the headlines THAT would generate! The World Team Championships continue in Halmstad, Sweden, April 29 - May 6, finishing this Sunday. You should be able to follow the action there with news, results, photos, and live and archived video. You can get the latest news on the ITTF Worlds News page. Make sure to check out the Point of the Day and the Daily Review! Here are some links, most but not all USA-centered. Team USA Complete The Tata Trick Shot Challenge (46 sec). Three shots, three bull's eyes! I think because women often hit more than the men, who often loop everything, they might be more accurate in this type of contest. Tense Engagements as USA Battle to Leave their Mark in Sweden, with links to video, by Matt Hetherington. Korea Unites to Play Japan! Here's the ITTF video (45 sec). Over the last few days he's put up several dozen new videos from the Worlds, many with commentary, including five more yesterday. Here's the video (6:19) - let's thank the ones who do the work! And it's to the tune of the Star Wars Cantina scene! I just received the following email regarding the South Bend Table Tennis Center juniors (coached by Dan Seemiller) - perhaps you can help out? Thanks for your support of our juniors! We've got $230 and the word just went out. Or you can forward this e-mail. If we can get momentum going this first day, I think it will really help. I've sent this to our SBTTC active list, folks at Kern Road Mennonite Church, Ms. Dooley at Dion's school last year, and Marty's extended family. Here's the video (5:39) from Tom Lodziak. "Attacking high balls should be easy. The ball is way up in the air. You have a big margin to get the ball over the net. How can you possibly miss? Easy peasy" "In this video I show you how to smash high balls consistently. The technique I show in the video isn’t the only smashing technique you can use, but I think it’s the easiest technique to start with." Here's a three-part serving tutorial from Tomorrow Table Tennis. I'd linked to parts 1 &2 previously, but part 3 came out just last week. Here's the Facebook poll created by Samson Dubina. "I think that ITTF should allow 1 challenge (similar to NFL) per match during international play? Many matches are won or lost from a serve fault or lack of a serve fault or an edge ball vs side ball, etc... What do you think? Would this be a cool feature for international matches? Vote NOW." Here's the video (29 sec) from Matt Hetherington. "A lot of people ask if there are any exercises they can do in the gym specific to table tennis muscle groups. Here is a good example of one which engages weight transfer from your toe, through legs, hips and core into a follow through with the arm! Happy gyming!" Robot Pong - Our Future Lords and Masters are Getting Good! Here's the video (71 sec). The robot is surprisingly good, as is his opponent. They are playing hardbat, so there's less spin. The final frontier for such robot play is dealing with spin - and I think they are a long way from that. I'm guessing the robot isn't going to return many of my serves, pushes, chops, or loops, not to mention high, spinny lobs. But I'd love to take it on in a straight hardbat hitting contest. But even there, if I get in trouble, I'm guessing I could throw in some chops and it'd miss. Would Roger Federer Have Dominated in Table Tennis? Here's the video Roger Federer's table tennis skills heavily praised by a competitive player (1:36) - Long-time USA player/coach/robot expert Larry Thoman is quoted. Here's the article from Business Insider, with Thoman quoted again: "It is universally accepted that the best place for developing into a world-class table tennis athlete is in China. The training environment there is regarded as several steps above what is available anywhere else in the world." Here's Shashin Shodhan's commentary. As in May 4, "May the Force [be with you]." Here's what you get when you Google "Star Wars Table Tennis." Here's the picture - um, yuck! Here's the video (8:50)! Note the Disclaimer Warning at the start! Here's some breaking news - rather than play their Women's Team quarterfinal match, the two Koreas will join forces. They will advance into the semifinals, where they'll play Japan, who defeated Ukraine in their quarterfinals. It's the first time they will have a unified team since they won Women's Teams at the 1991 Worlds, as commemorated in the 2012 movie, "As One." My first thought on this was, "Is this legal, for two different countries joining up like this in the middle of a tournament? Can USA join forces with China perhaps?" But we'll let this Ping-Pong Diplomacy take precedence over such niceties. Here's what USATT CEO Gordon Kaye posted on Facebook: "I am truly moved by what is unfolding in front of my eyes in table tennis, and more importantly, the world. A few moments ago, the teams from North Korea and South Korea, due to meet in the quarterfinals of the 2018 ITTF World Team Table Tennis Championships, both elected not to compete against each other and instead have decided to compete together for the remainder of the tournament as a unified Korea. This is what sport is supposed to be about. Peace. Friendship. Changing the world." Here's the actual video (1:57) of the announcement at the Worlds. Here are articles on the breaking news. North and South Progress, Unified Korea to Stand in Semifinals, by Matt Hetherington/USATT. "A historic moment took place today in Halmstad as a North and South Korea showdown was set to take place in the Women's quarterfinal stage of the 2018 Leibherr World Table Tennis Championships. No match would take place and a moment in history would repeat itself as table tennis played its hand again as a diplomatic tool." As one, Korea unified, the power of table tennis from ITTF. "North Korea and South Korea have told the umpires that they don’t want to compete on the table against each other here in Halmstad, Sweden, when they walked into the court for their Liebherr 2018 World Team Table Tennis Championships quarter-final match. Instead, both teams requested that they want to form a unified Korean Team to compete together in the semi-final." Unification is the outcome many did not see coming, from Johnathan Humbles/Butterfly. North and South Korea combine their women's table tennis team at World Championships, from ESPN. Table Tennis: Koreas Form Unified Team at World Championships, from New York Times. The World Team Championships continue in Halmstad, Sweden, April 29 - May 6. You should be able to follow the action there with news, results, photos, and live and archived video. 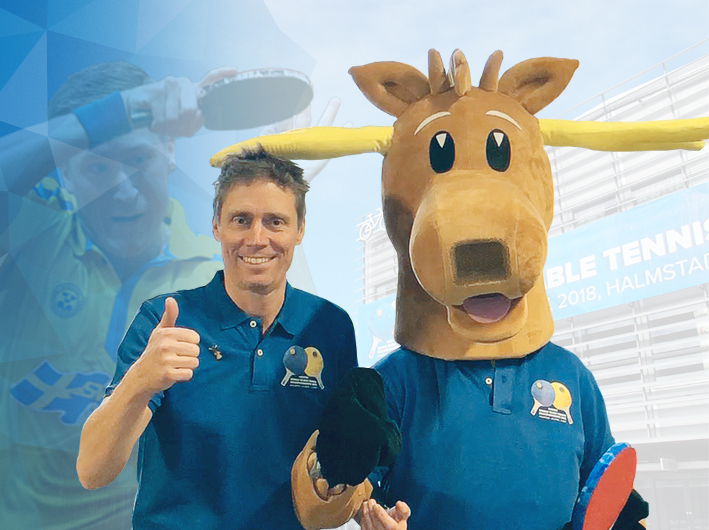 You can get the latest news on the ITTF Worlds New page. Make sure to check out the Point of the Day and the Daily Review! Here's a great new article from USATT, Kanak Jha the Backbone as USA Advance in Favorable Standing, by Matt Hetherington. See more USATT coverage from yesterday on the USATT news page. Here's the ITTF article. Here's their new Strategic Plan. Over the lasts two days he's put up a 16 new videos from the Worlds. Why not browse over them? On interesting one was, Did Japan lose on purpose? This was about their losing to England, where some thought they might have dumped to get a better draw. But the video actually debunks that theory, showing they gained no advantage by dumping, and that it only hurt them. As noted in my (short) blog yesterday, in the morning I went to the Piccard Surgery Center in Rockville, MD, for a Shoulder Cortisone Injection with Arthrogram. Although they gave me a local anesthesia so it wouldn't hurt so much, they correctly warned me that it wouldn't reach all the way in - and it was VERY painful. Those screams you heard were not Darth Vader, but me, retroactively used in Star Wars. The arm hurts a lot this morning, and I'm told will do so for a day or so - and then, by Monday, the prediction is it'll be a lot better, just in time for me to rush out to Sweden and beat the Chinese. New from EmRatThich - Eight new videos from the Worlds. Soccer Pong? Jon Persson of Sweden (world #63) demonstrating his foot juggling skills with a ping-pong ball. "What if Frank Caliendo played table tennis as Morgan Freeman against a 12-year old?" Here's the video (4:13) as comedian/impressionist Frank Caliendo talks about ping-pong on the Rich Eisen Show. Here's another video (2:31) also on the same show where you see him play table tennis. Frank's got a 1665 rating - he's played in two U.S. Opens. But his last tournament was in 2015, and he's not only lost a lot of weight since then, I'm told he's improved at table tennis as well, probably to 1800+. He came to MDTTC once, and I got to play doubles with him! (I played awful.) My question is - When will Caliendo do Trump commentating as he plays table tennis? Tournament Officials: Learn 4 Keys to Maximizing Your Performance! Here's the article from Samson Dubina. "Before I begin this article, I need to first say that table tennis umpires and referees are present at tournaments for your own good. Without rules and officials, table tennis would be chaos. With that said, I want to give you a few tips that I have learned during the last 400 tournaments that I have played." Here's the issue that came out yesterday. Here's the video (10 sec) of this wacky point. Here's the entire match (11:33). Here's the video (41 sec) as Adam Bobrow meets up with the New Zealand team at the airport, and all Pong breaks out. Bad Sportsmanship - Demolition Pong! Here's the video (7 sec). Did the flying racket survive? Did the kicked umpire table survive? Will the umpire have to undergo years of therapy after this attack? Oh wait, that's for the player! Here's my new article from Orioles Hangout! It's my 33rd article for them. For you non-baseball fans, Manny is the Orioles best player, and he's having an incredible start to his season, unlike the rest of the team - and since he'll be a free agent after this season, will likely be traded for prospects.